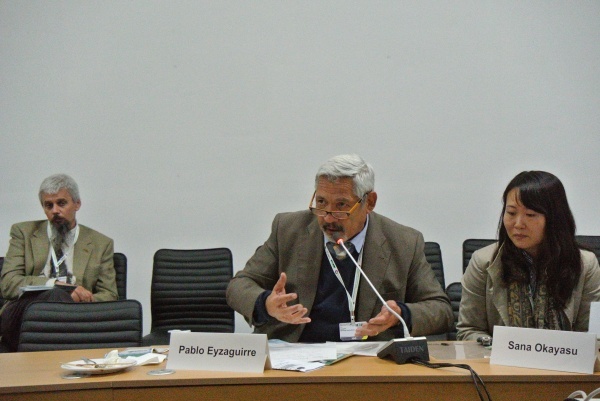 The United Nations University Institute for the Advanced Study of Sustainability (UNU-IAS), held a side event titled “Mobilizing Resources for mainstreaming biodiversity into production landscapes and seascapes” at the Twelfth Meeting of the Conference of the Parties to the Convention on Biological Diversity (CBD COP 12) on 8 October 2014 in Pyeongchang, Republic of Korea, with the purpose of illustrating approaches developed under the Satoyama Initiative to mobilize resources for actions at the community level for the sustainable use of biodiversity. The seminar began with opening remarks by Mr. Kazuaki Hoshino, Senior Adviser to the Ministry of Environment, Japan. 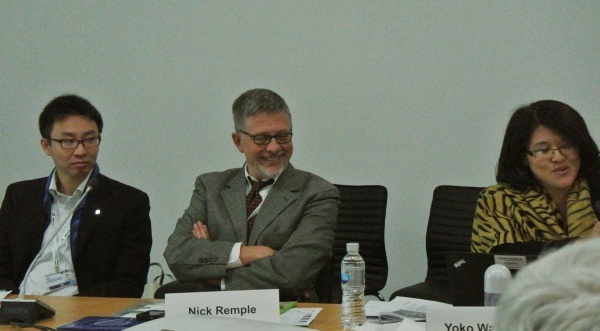 He stressed that a critical role of the Satoyama Initiative is to promote the sustainable use of biodiversity, with the goal of creating societies in harmony with nature, and provided a brief history of his Ministry’s involvement in the development of the International Partnership of Satoyama Initiative (IPSI). 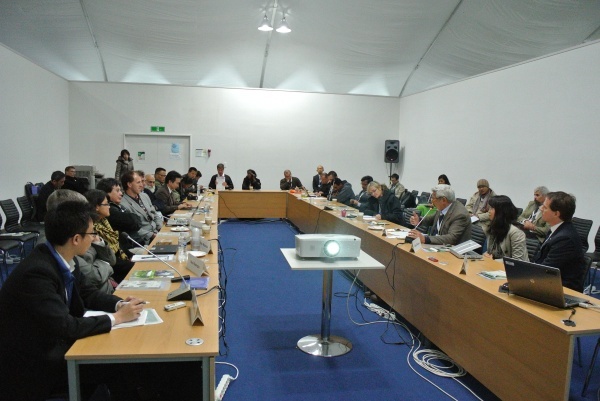 IPSI was launched in 2010 during the Tenth Meeting of the Conference of the Parties to the Convention on Biological Diversity (CBD COP 10) in Nagoya, Japan, and Mr. Hoshino observed IPSI’s success in that its membership has increased from 51 organizations at its launch to 164 as of October 2014. Following the opening remarks, Mr. William Dunbar from UNU-IAS and the IPSI Secretariat gave a presentation entitled “IPSI and Resource Mobilization: Partnership and Collaboration”, explaining the concept of the Satoyama Initiative as a global effort to realize societies in harmony with nature through promoting revitalization and sustainable management of production landscapes and seascapes with benefits for both biodiversity and human well-being. He then introduced some of IPSI’s activities, focusing on its practice of creating collaborative activities among member organizations. 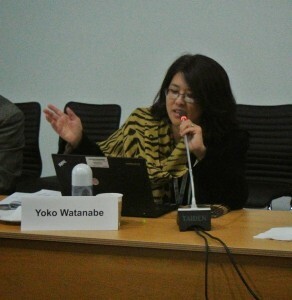 These collaborative activities include the three resource-mobilization mechanisms that would be explained in the rest of the presentations in the event: the Satoyama Development Mechanism (SDM); the Community Development and Knowledge Management for the Satoyama Initiative (COMDEKS) Programme; and a new mechanism with funding from the Global Environment Facility (GEF). Ms. Sana Okayasu from the Institute for Global Environmental Strategies (IGES), spoke next to introduce “The Satoyama Development Mechanism: Kick-starting actions for the sustainable use of production landscapes and seascapes”. SDM was launched in 2013 to provide an incentive for IPSI members to strengthen partnerships and generate a knock-on effect from joint activities. The mechanism provides up to USD 10,000 to projects in community and field-based activities, research activities, workshops and conferences, and production of educational materials and their dissemination. Ms. Okayasu gave an overview of the first round of SDM 2013, which supported six projects in Thailand, Nepal, Uganda, Chinese Taipei, Peru and the Russian Federation. She then gave a progress report on SDM 2014, the second round, for which the funding recipients were to be announced soon, in November 2014. Mr. Alejandro Argumedo from Asociacion ANDES, one of the SDM 2013 recipients, presented his organization’s work in “Supporting Indigenous Peoples’ Biocultural Landscapes in the Andes”. Asociacion ANDES manages The Potato Park in Cusco, Peru, which applies an integrated landscape approach based on indigenous practices to improve agricultural biodiversity conservation, food production, biocultural heritage, livelihoods, and ecosystem services. The Potato Park started with 450 varieties of potato, and has more than 5000 today. Through its work, the local people have achieved improved landscape governance, linkages between traditional knowledge and science, a more sustainable economic model, local adaptive management of food production environment, linkages between biological and cultural diversity, community planning and coordination, and policy development with a bottom-up process. Mr. Argumendo outlined the organization’s plans to scale up successful practices, and to create a similar Quinoa Park in the area. Mr. Nick Remple of UNDP next gave an explanation of the COMDEKS Programme as another example of IPSI resource-mobilization activities. COMDEKS has provided financing for over 100 community-based projects in 20 countries through the GEF Small Grants Program. Projects contribute to community resilience through a landscape- or seascape-level adaptive management strategy. Investment in community capacity-building has resulted in individual and organizational empowerment for collective action, communities making and implementing their own decisions, increased ownership, commitment, responsibility and skills, learning by doing, and participation in policy dialogue. After an in-depth explanation of COMDEKS activities in Cambodia as a case study, Mr. Remple said that in the future, UNDP is planning to replicate and adapt the COMDEKS landscape approach further to GEF Small Grants Program Country Programs. Ms. Yoko Watanabe from the Secretariat of the Global Environment Facility (GEF) provided an explanation of the “GEF-6 Strategy: Mainstreaming Biodiversity into Production Landscapes and Seascapes”. She explained that two elements of the GEF-6 Biodiversity Strategy relate directly to the Satoyama Initiative: Sustainable Use of Biodiversity, and Mainstreaming Biodiversity Conservation and Sustainable Use in Production Landscapes, Seascapes and Sectors. The latter includes the “Integration of Biodiversity and Ecosystem Services into Development and Finance Planning”, and between 2004 and 2014, GEF has supported 327 projects with USD 1.6 billion and achieved co-financing of USD 5.2 billion in Asia, Latin America, Africa, Eastern Europe, and globally. GEF is starting a new pilot project on mainstreaming biodiversity conservation and sustainable management in priority socio-economic production landscapes and seascapes (SEPLS), together with Conservation International Japan, UNU-IAS and IGES. The project will be composed of the demonstration of SEPLS-related projects, provision of a knowledge base and tools for better management of biodiversity in SEPLS, and capacity-building and information exchange to enhance their management. Potential target geographies include Indo-Burma, Madagascar, and the tropical Andes. 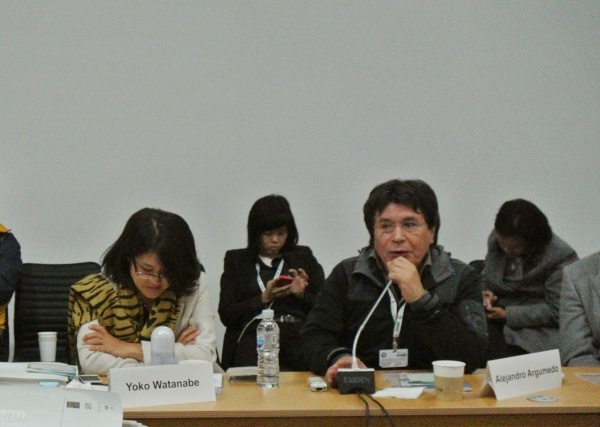 During the following panel discussion, moderator Dr. Pablo Eyzaguirre from Bioversity International further guided the audience through the purpose of the Satoyama Initiative, such that local visions are the basis for landscape and seascape management by communities so that the communities can manage their own resources. Related small-grant projects have a policy component, in which communities can develop their capacity to negotiate with governments. Thus, Satoyama Initiative-related funding is helping to realize cross-cutting benefits and to scale up local expertise and experiences to make global impacts, although funding is still limited. Audience members raised the issue of communities that gain their livelihoods across geographical boundaries, and even across ecological boundaries such as watersheds or mountain ranges, with the explanation that the physical scale of production landscapes and seascapes depends on the communities that rely on them. A similar type of dynamic human mobility is seen in Peru’s Potato Park, where not only people but also cultural elements of the community returned along with increased agricultural biodiversity in potato varieties. At the same time, both the need and potential for improved governance within such communities and their capacity to negotiate with government authorities was raised. A contrasting issue was raised as to how all of this relates to urban landscapes which can also incorporate a significant amount of food production, which is an ongoing issue within the Satoyama Initiative. While the lively discussion could have gone on, time forced Dr. Eyzaguirre to cut it off by thanking all presenters and participants, and the event was brought to a close, with many attendees lingering to learn more from UNU-IAS staff and others about how to become more involved with the Satoyama Initiative.